Toys could play an important role in helping children interact with computers a study has found. Children find it just as easy to use an interactive soft toy as a mouse researchers working on a project known as CACHET (Computers and Children's Electronic Toys) have concluded. The project, funded by the Economic and Social Research Council, found that the idea of a toy as a technology companion could be extremely useful in getting children comfortable with computers. "Using touchable technology, such as a soft toy, may be a way of encouraging very young children to interact with computers," said Dr Lydia Plowman, who led the study at the University of Stirling. Her 18-month study used toys developed by software giant Microsoft to look at how children interacted with technology. She found that the expensive toys - which were only ever on sale in the US market - might not be the answer. The results suggested that, despite a sophisticated vocabulary, the electronic companions were no substitute for human interaction. Microsoft has since withdrawn the toys and their high price tag is likely to have been a factor in their failure to catch on. "They cost $99 and it seems that they did not sell enough to warrant the investment," she said. The toys, based on characters from the Marc Brown series of children's books, were aimed at four to eight-year-olds. They appeared as traditional soft toys but could also be used in conjunction with a CD Rom and special PC adaptor to act as an electronic helper for children learning basic language and number skills on computers. Despite the toys having a vocabulary of 10,000 words the study found the children preferred to get human help. "The toys were too limited for the tailored help young children need," said Dr Plowman. Speech recognition software needs to improve significantly before the perfect PC toy can be designed thinks Dr Plowman. 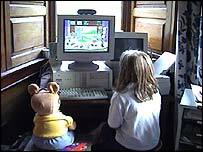 But signs that children were comfortable using toys in conjunction with computers were encouraging. "We found that children can co-ordinate the multiple links between toy and screen and don't appear to get confused," said Dr Plowman. "Having a toy also seemed to increase the social interaction at the computer with the children talking to each other and helping each other more," she added.